Imagine that one day you are in the shoes of an ambitious archaeologist who gets to know that there are some ancient relics in a foreign country far away from your city. As you are really curious and want to find something important to build your carrier, you decide to visit the area and see if you can find something appreciable. 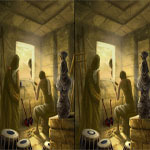 That�s the story of the totally new The Reincarnationist point and click online game, in which you will need to use your eyes and observational skills to find your prize and spot all the disparities between the images. So, are you ready for this eventful trip? Then go ahead and have a good time!